This article focuses on investigating adults with early-onset epilepsy and intellectual or physical disability within adult neurology services. We aim to guide general neurologists in the diagnostic reassessment of people with epilepsy and complex neurological problems of unknown cause. Following an overview, we address imaging, electroencephalography, genetic studies and metabolic testing, and give examples where diagnosis directly influences treatment. Aetiological diagnosis serves to inform prognosis, guide treatment and provide a framework for genetic counselling. This article aims to guide general neurologists in planning investigations for patients with complex neurology and epilepsy of unknown cause, when seen within adult neurology services. These patients, usually young adults, are beyond the age when development is critical. Hence, some do not consider it important that the underlying aetiological diagnosis remains elusive. This view can be challenged. Having presented in early life, many have neither benefitted from advances in investigations and assessments that are now routine in paediatric neurology practice nor undergone current neonatal metabolic screening (table 1), which has evolved and varies between countries. Aetiological diagnosis, where possible, is important, not only to end a longstanding quest by the individual or relatives and clinicians, nor simply for academic reasons. It serves to inform prognosis, anticipate difficulties, guide treatment and provide a framework for genetic counselling. Sometimes, although relatively infrequently (but increasingly so), an aetiological diagnosis results in specific treatment with potential for a better outcome. With further advances, more people will benefit therapeutically when the underlying diagnosis is known. We focus on investigations of cause and not on management. Following an overview, we provide sections on imaging, electroencephalography, genetic studies and metabolic testing, followed by examples where diagnosis influences treatment. There is no substitute to obtaining an account of the early history and reviewing a patient’s old notes and previous investigations. The underlying cause may be strongly suspected based on a consistent history and supportive evidence. If not, and despite overlap in presentation between different conditions, the early history may give clues regarding the cause. Review of previous management also informs treatment decisions. In addition to information about family history, pregnancy, delivery, early development, other antecedent history, age of onset of the epilepsy, seizure types and history of status epilepticus, it is helpful to note: if there were febrile seizures and their nature; whether there was early photosensitivity; whether developmental delay was already present before the epilepsy began or became apparent or accelerated after; the nature of the developmental delay; any behavioural problems, cognitive impairment and/or associated neurological deficit and, where present, if fixed or progressive; whether there was a major early insult with secondary sequelae; whether there were triggers or fluctuations to suggest a metabolic disorder; whether there is multisystem involvement and if there are syndromic features or cutaneous manifestations. Regarding previous treatment, the neurologist needs to know which antiepileptic drugs were effective, which had made seizures worse and how, and whether pyridoxine, pyridoxal phosphate or the ketogenic diet were tried. Some people with spasticity are thought to have cerebral palsy, implying an acquired prenatal or perinatal insult to the developing brain. Genetic conditions, however, may be mislabelled as cerebral palsy. For example, the complex hereditary spastic paraplegias are an increasingly recognised diverse group of genetically determined disorders, with progressive corticospinal degeneration and additional neurological or systemic features. Their inheritance can be dominant, recessive or X linked and their age at presentation varies from birth to adulthood with epilepsy and learning difficulty a recognised feature. Imaging findings may include a thin corpus callosum (figure 1). Thus, in a patient with a diagnosis of cerebral palsy, the absence of evidence of an early insult on history or imaging, particularly if there is evidence of progression, suggests the need to review the diagnosis. MRI in autosomal recessive hereditary spastic paraplegia: high T2 signal intensity in periventricular white matter and corona radiata with thin corpus callosum. Reprinted with permission from Hourani R, et al. Am J Neuroradiol 2009;30(5):936–40. DOI: https://doi.org/10.3174/ajnr.A1483. Brain imaging is indicated in childhood-onset epilepsy ‘when localisation-related epilepsy is known or suspected, when the epilepsy classification is in doubt or when an epilepsy syndrome with remote symptomatic cause is suspected’. The yield is good with nearly half with new-onset focal seizures having abnormal imaging (excluding benign rolandic epilepsy) and in 15%–20% the imaging provides useful information on aetiology and/or seizure focus.1 Immature myelination may affect interpretation of scans in children under 2 years. These need repeating if seeking dysplastic lesions. Specialist review of previous imaging allows for better understanding of abnormalities and better assessment of the quality of imaging, sequences used and whether MR spectroscopy was included. Previous imaging may show evidence of non-progressive acquired focal pathology such as perinatal stroke or periventricular leukomalacia in preterm infants. There may be abnormalities or lesions suggesting an underlying disease process, including metabolic. Previous treatment for central nervous system tumours or ventriculo-peritoneal shunts for hydrocephalus favour imaging surveillance, not least to provide a baseline. Where an original tumour had been successfully treated, there can be later complications, developmental, cognitive or endocrine. New tumours, particularly meningiomas, may occur following early radiation. Given inherent difficulties in clinical assessment of this patient group and the many confounding factors, new baseline imaging should be considered . Imaging abnormalities may be non-specific. According to Guerrini and Dobbyns,2 those ‘classified as having polymicrogyria have such diverse clinical courses and outcomes, causes and recurrence risks, associated malformations and syndromes, and imaging and neuropathological abnormalities as to render the term no more specific than that of intellectual disability’. Polymicrogyria with or without schizencephaly is associated, for example, with extrinsic causes such as vascular insufficiency as may occur in twin pregnancies or cytomegalovirus infections and, infrequently, with genetic syndromes. Nevertheless, many malformations indicate genetic causes, some known, others suspected (figure 2).3 4 The first step is to describe the imaging abnormality, followed by appropriate genetic testing (table 2). Mutations in DEPDC5 gene, encoding a repressor of the mTOR signalling pathway, are implicated in both familial focal epilepsies and cortical dysplasia.5 Dysregulated mTOR activity is also implicated in epileptogenesis in tuberous sclerosis complex, and everolimus, an mTOR inhibitor, is now licensed for treating refractory epilepsy in tuberous sclerosis complex; it reportedly has both early and late benefit, suggesting an antiepileptogenic effect. This development opens the door for exploring such treatment in people with other cortical malformations where the same pathway is implicated in epileptogenesis.6 Inherited disorders of metabolism are also associated with imaging changes (figure 3), often not specific, with atrophy the predominant finding by adulthood. Brain MRI of patients with different malformations of the cerebral cortex. A T1-weighted axial section. Posterior to anterior pachygyria in a boy with LIS1 mutation. B T2-weighted axial section. Diffuse SBH in a girl with DCX mutation. C, D T2-weighted axial section and T1-weighted sagittal section. Lissencephaly and cerebellar hypoplasia in a girl with RELN mutation. E, F T1-weighted axial section and T1-weighted sagittal section. Thickened cortex with simpliﬁed gyral pattern and cerebellar hypoplasia in a girl with TUBA1A mutation. G T1-weighted axial section. Diffuse simplified gyral pattern with prominent thickening and infolding of the sylvian fissures in a boy with TUBB2B mutation. H T1-weighted axial section. Typical, classical bilateral PNH in a girl with an FLNA mutation. Bilateral nodules of subependymal heterotopia are contiguous and rather symmetric, extensively lining the ventricular walls. I, J T2-weighted axial section showing mild colpocephaly with unilateral PNH (white arrowhead) and T2-weighted sagittal section through the midline, showing cerebellar vermis hypoplasia (black arrowhead) with mega cisterna magna in a patient carrying a deletion in the 6q27 chromosomal region. K T2-weighted axial section. 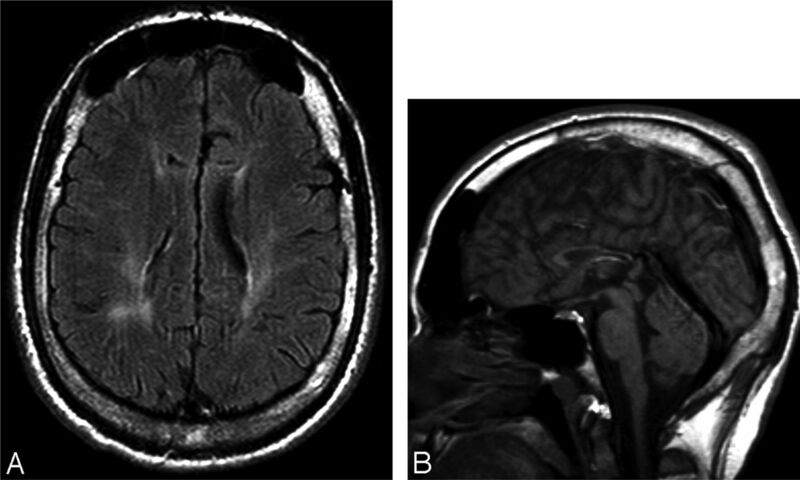 Bilateral frontoparietal polymicrogyria in a boy with GPR56 mutation. L, M T2-weighted axial section and T1-weighted coronal section. Pachygyria and perisylvian polymicrogyria in a girl with DYNC1H1 mutation. N Axial T1-weighted section in a patient with a mosaic PIK3R2 mutation. O, P T1-weighted and T2-weighted axial images form patients carrying mosaic mutations in the MTOR gene with different percentages of mosaicism [O: p.Thr1977Ile, 20% of mosaicism in blood, P: p.Ser2215Phe, 5.5% of mosaicism in dysplastic brain tissue) showing bilateral cortical dysgyria (O) and focal cortical dysplasia (P, white arrowhead)]. Reprinted with permission Parrini E, et al. Genetic basis of brain malformations. Mol Syndromol 2016;7:220–33. DOI: 10.1159/000448639 (S. Karger Ag, Basel). MR scan of brain in cerebrotendinous xanthomatosis. Reprinted with permission from Kirmi O, Murphy E, Carecchio M, et al. Teaching neuroimages: progressive asymmetric parkinsonism and tendon xanthomas. Neurology 2011;77:e97. A practical consideration is whether patients can cooperate to allow for MRI, with or without sedation, or whether they need general anaesthesia. This can be performed at the same time as other required investigations, such as blood tests, lumbar puncture (if indicated consider neurotransmitter assays) and physical examination. This approach does not allow for staged investigations although DNA can be stored and genetic testing deferred. If EEG had previously proved difficult to perform, electrodes can be placed post-anaesthetic. Lennox–Gastaut syndrome is a severe epileptic encephalopathy typically occurring between 3 and 5 years of age, in 20% evolving from infantile spasms. There are multiple possible causes and it is symptomatic in 75%, for example, secondary prenatal or perinatal insults and brain malformations. It has a classic triad of multiple seizure types (commonly tonic, atonic and atypical absences as well as other seizure types, including generalised tonic-clonic, focal and myoclonic seizures and episodes of non-convulsive status epilepticus), characteristic but not pathognomonic EEG findings (≤2.5 Hz slow spike and wave discharges and 10–20 Hz paroxysmal fast rhythms during non-rapid eye movement sleep) and intellectual disability. Not all patients have this triad at onset and tonic seizures—the hallmark seizure of Lennox–Gastaut syndrome—may not be present initially or be subtle or only evident on sleep EEG. While Lennox–Gastaut syndrome is not an aetiological diagnosis, it may have increasing relevance to treatment options. The International League Against Epilepsy (ILAE) taskforce has provided a comprehensive review of electroclinical features in epilepsies.12 13 Review of early recordings is recommended. Robust findings during childhood may become subtle and less evident in adulthood. In patients with no obvious acquired cause, a genetic cause probably underlies early onset presentations, whether or not the problems are confined to the nervous system. http://www.epilepsydiagnosis.org is a useful resource that includes an up-to-date list of electroclinical syndromes and epilepsy genes; the ‘Report of the ILAE Genetics Commission’ provides a useful discussion on genetic testing in the epilepsies.14 Genetic causes need not be hereditary as de novo mutations can occur. On the other hand, other affected family members may have a milder or different phenotype. There may be a family history of developmental delay, autism or mental health disorders. Genetic testing also includes (1) testing for mutations in specific genes where the clinical history is very suggestive (table 3) or much more usefully, (2) running panels of ‘epilepsy genes’ (although available panels currently differ widely as to which genes are included and (3) genome-wide scans, where panels may also be employed. In a retrospective cohort study of 110 patients with intractable epilepsy and global developmental delay, there were genetic causes identified in 28%, and 4.5% had a treatable inherited metabolic disease. Targeted next-generation sequencing increased the genetic diagnostic yield from less than 10% to more than 25% in patients with epileptic encephalopathy,18 where progressive cerebral dysfunction, beyond that of the underlying pathology, most likely relates to frequent epileptiform activity. Testing for mitochondrial disease should also be considered, probably more often than is currently done. Patients with mitochondrial disease, unidentified for years, may attend adult epilepsy clinics as in the case described (box 1). Mitochondrial disorders are common with a prevalence of 1/5000–1/10 000. Maternally inherited mitochondrion genetic material (mtDNA) codes for only a minority of proteins involved in mitochondrial function, the remainder coded for by nuclear genes (figure 4) . A young employed adult male patient had a history of a generalised epilepsy syndrome with onset at the age of 23 years. He had generalised tonic-clonic seizures, myoclonus, absences and clinical and electrographic photosensitivity. There were some atypical clinical features in addition to EEG discharges with slow photic stimulation (figure 4). He was of relatively short stature and was occasionally unsteady. He became fully controlled when a small dose of lamotrigine was added to his long-term valproate. He remained stable until he had a ‘minor’ closed head injury at the age of 40 years after which he decompensated clinically and radiologically becoming cortically blind and encephalopathic before succumbing. Muscle biopsy showed abnormal Gomori trichome staining and 4% negative cytochrome oxidase fibre staining. Genetic testing confirmed an A3243G positive mutation. In retrospect, the generalised epilepsy was likely due to mitochondrial disease. EEG showing irregular generalised discharges and slow photic stimulation in mitochondrial disease, generalised epilepsy and A3243G mutation. As mitochondria are the principal suppliers of cellular energy through oxidative phosphorylation, mitochondrial dysfunction typically leads to multisystem disease. Neurological presentations accompanied by diabetes mellitus, cardiomyopathy, short stature or liver disease prompt consideration of mitochondrial disorder but the phenotypic spectrum is wide. Within epilepsy, while many have phenotypes conforming to well-recognised patterns, notably myoclonic epilepsy with ragged-red fibres (MERRF) and myoclonic epilepsy with lactic acidosis and stroke-like episodes, it is important to remain aware of the possibility of mitochondrial disease with less characteristic clusters of clinical features. Commonly implicated is the POLG gene, encoding the catalytic subunit of polymerase gamma, central to mtDNA replication and repair.19 There are many phenotypes associated with POLG mutations, whether homozygous or compound heterozygous, with intractable epilepsy a common feature spanning all ages. A systematic literature review found that over 80% of patients with POLG-related epilepsy had at least one of three common pathogenic variants (p.Ala467Thr, p.Trp748Ser, p.Gly848Ser). Seizure types are mixed with a propensity to posterior hemisphere seizures with ictal visual phenomena and migraine overlap. Unexplained status epilepticus prompts consideration of Alpers’ syndrome, another autosomal recessive mitochondrial cytopathy caused by mutations in the (nuclear) POLG gene. Clinical features include epilepsy, liver dysfunction, ataxia, myoclonus and developmental regression in children and dementia in adults. Acute infections and drugs including valproic acid, which is contraindicated, may exacerbate the condition. While Alpers’ syndrome can present in adults, most present in early childhood. There are many inherited disorders of metabolism22 causing epilepsy and other features and these cannot be completely listed here. Table 4 lists some more frequent disorders, in particular those where there is a specific treatment. Biochemical investigation is tailored to the clinical presentation, but as a minimum is likely to include a plasma amino acid profile, plasma methylmalonic acid, acylcarnitine profile and urine organic acid profile. Epilepsy with inherited metabolic disease usually occurs as part of a larger clinical spectrum. Suggestive clinical features include: (1) neurological impairment (especially neurodegeneration), (2) myoclonic seizures, (3) a mix of generalised and partial-onset seizures, (4) multisystem disease, for example, hepatosplenomegaly and (5) seizures related to either fasting or specific foods (eg, high protein). Efficient sample collection and processing require discussion with the laboratory and the inherited metabolic disease team. In the following section, we expand on some metabolic disorders that require specific treatment, although there may be only limited benefit with delayed treatment. There are nationally agreed emergency guidelines for adults who present with acute decompensation in the UK, available at http://www.BIMDG.org.uk. Epilepsy in patients with many inherited metabolic diseases is commonly secondary to childhood decompensation with hypoglycaemia (eg, fatty acid oxidation disorders, glycogen storage disorders). There are likely to be many patients in adult practice with early-onset epilepsy and a compatible clinical syndrome yet to be screened. Although SCN1A mutations are better known to cause Dravet syndrome or ‘genetic epilepsy with febrile seizures plus’ (GEFS+), there are also less distinct presentations. Suggestive clinical features include: febrile seizures (including those persisting beyond the age of 6 years), multiple seizure types (myoclonic, absence, unilateral focal (the side of hemiclonic seizures varies), focal with impaired awareness and generalised, with early photosensitivity), developmental regression after epilepsy onset, precipitation of a catastrophic epilepsy by vaccination and deterioration of the epilepsy with certain antiepileptic medications such as carbamazepine, lamotrigine or vigabatrin. Later, there is deterioration in gait and decline in mobility. The identification of an SCN1A mutation leads to avoiding antiepileptic medications documented to worsen the condition and selecting combinations of standard antiepileptic medications more likely to be effective in addition to stiripentol. There is also accumulating evidence for cannabidiol and fenfluramine. Other sodium channel mutations, for example, in SCN2A and SCN8A, have potentially different responses to treatment. 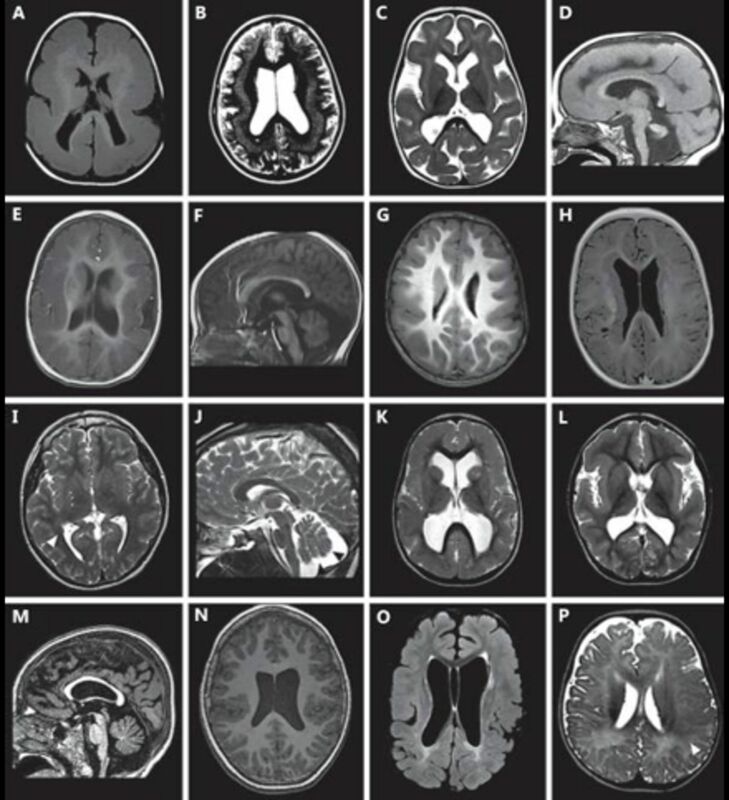 Glucose transporter type 1 (GLUT1) deficiency syndrome, due to SLC2A1 mutations, results in epilepsy, paroxysmal exertional dystonia, ataxia and intellectual disability.24 25 Its severity is variable, as is the age of presentation and diagnosis in adulthood is not uncommon. Seizure types include absence (typically early onset at 2 years of age), generalised tonic-clonic seizures, complex partial seizures and myoclonic seizures.26 It may cause early onset absence status epilepticus. The diagnosis is made by lumbar puncture in the fasting state (4–6 hours), with samples for plasma glucose concentration taken before cerebrospinal fluid (CSF) sampling. CSF cell count and protein concentrations are normal and lactate is low/normal. In GLUT1 deficiency syndrome, the CSF/plasma glucose ratio is ≤0.45. SLC2A1 mutations are present in 85%–90% of patients. Ketogenic dietary therapy is effective for many patients. The urea cycle is responsible for the detoxification in the liver of ammonia, a byproduct of protein metabolism. Inherited defects can present at any age with hyperammonaemic encephalopathy precipitated by metabolic ‘stress’, for example, fasting, infection, prolonged exercise or postpartum (as the uterus, a protein load, is metabolised). Adults may have a history of lifelong protein or exercise avoidance, which cause nausea or headaches. Chronic unrecognised hyperammonaemia may be associated with learning difficulties. Seizures occur during acute decompensation or secondary to previous decompensations. By far the most common urea cycle defects is X linked ornithine transcarbamylase deficiency. Plasma ammonia is typically >100 μmol/L. Diagnostic samples include a plasma amino acid profile, urine organic acid profile (looking for orotic acid) and DNA. Valproate is a risk factor for hyperammonaemia and can also precipitate hyperammonaemia in people with a urea cycle defect. Guidelines for the emergency management of urea cycle defects are available on the British Inherited Metabolic Disease Group website at http://www.BIMDG.org.uk. Cobalamin (vitamin B12) is an essential cofactor for the activity of two enzymes, methionine synthase and methylmalonyl-CoA mutase. Disorders of intracellular cobalamin metabolism lead to isolated methylmalonic acidaemia or combined methylmalonic acidaemia and hyperhomocysteinaemia (figure 5). The most common of the intracellular cobalamin defects is the cobalamin-C defect. As well as seizures and cognitive impairment, other variable features include cytopaenia, glomerulonephropathy, spinal cord disease, psychiatric manifestations and thrombotic events. 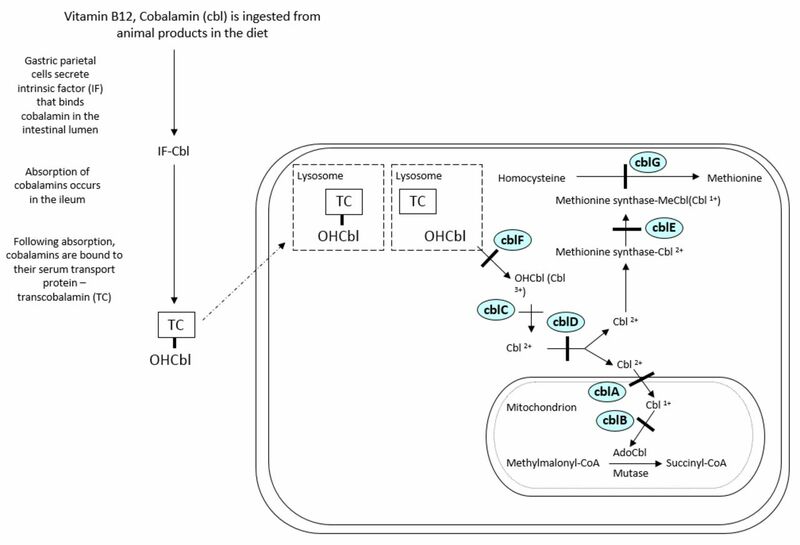 Cobalamin absorption, transport and intracellular metabolism. Dietary B12 (cobalamin) is ingested from foods of animal sources. cobalamin is released from its binding proteins in the stomach and forms a complex with IF. Intrinsic factor–cobalamin interacts with a receptor protein, cubilin, in the ileum. Cobalamin is then transported across the enterocyte into the portal blood system and travels to cells for further metabolism bound to transcobalamin II. Transcobalamin II facilitates cobalamin uptake by cells and into lysosomes. Cobalamin is released into the cytoplasm, the central cobalt atom is reduced and cytosolic methylation forms methylcobalamin (required by the enzyme methionine synthase) or mitochondrial adenosylation forms adenosylcobalamin (required by the enzyme methylmalonyl CoA mutase). Reprinted with permission from Murphy E. Cognitive and behavioural manifestations of disorders of homocysteine metabolism [Chapter 28]. In: Nass R, Frank Y, eds. Cognitive and behavioral abnormalities of pediatric diseases. USA: Oxford University Press, 2010. IF, intrinsic factor. Classical homocystinuria is caused by deficiency of the cystathionine β-synthase enzyme, which metabolises homocysteine to methionine (figure 6). An amino acid profile shows raised plasma homocysteine and methionine, while cysteine concentrations may be low. Clinical findings include marfanoid features, lens dislocation, learning difficulties, psychiatric disease and thrombotic complications. Not all affected people have these features: in particular, pyridoxine-responsive individuals may be otherwise completely normal and present for the first time in adulthood with isolated cerebral thrombosis and seizures. Metabolism of homocysteine. Methionine is converted to S-adenosylmethionine by the enzyme methionine S-adenosyltransferase. S-adenosylmethionine is a methyl-group donor for a number of transmethylation reactions. One of these reactions produces S-adenosylhomocysteine, which is cleaved to adenosine and homocysteine by S-adenosylhomocysteine hydrolase. Homocysteine is then either recycled back into methionine or condensed with serine to form cystathione. Recycling involves methyl transfer from either 5-methyl-tetrahydrofolate, catalysed by cobalamin-requiring 5-methyl tetrahydrofolate-homocysteine methyltransferase, or betaine, catalysed by betaine-homocysteine methyltransferase. Cystathionine is cleaved to cysteine and alpha-ketobutyrate by cystathione gamma-lyase. The final step of the trans-sulfuration is catalysed by sulfite oxidase and converts sulfite to sulfate. folate metabolism. Reprinted with permission from Murphy E. Cognitive and behavioural manifestations of disorders of homocysteine metabolism [Chapter 28]. In: Nass R, Frank Y, eds. Cognitive and behavioral abnormalities of pediatric diseases. USA: Oxford University Press, 2010. 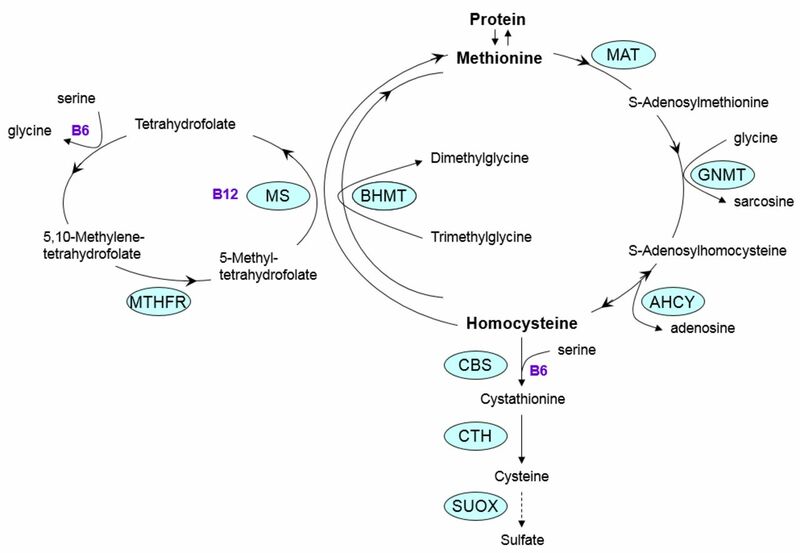 AHH, S-adenosylhomocysteine transferase; BHMT, betaine-homocysteine methyltransferase; CBS, cystathione β-synthase; γCT, γ-cystathionase SO sulfite oxidase; GNMT, glycine N-methyltransferase; MAT, methionine S-adenosyltransferase; MS, methionine synthase; MTHFR, 5,10-methylenetetrahydrofolate reductase. Treatment generally aims to maintain methylmalonic acid and total homocysteine concentrations as close to normal as possible while avoiding catabolism and high protein intake. Medications for intracellular cobalamin defects include regular lifelong intramuscular hydroxocobalamin (to maximise residual enzyme function), betaine and folic acid to increase methionine and decrease total homocysteine. The folates (vitamin B9) are important in DNA synthesis and repair, and in reactions involving the transfer of one-carbon groups, for example, methylation, formylation and so on. Its synthesis and transport is complex, and inherited disorders typically cause neurological problems and/or anaemia (figure 7). Folic acid is synthetic and not found in the body. Folinic acid is the reduced form that is converted to 5-methyltetrahydrofolate, the major active form in blood and CSF. Both folic acid and folinic acid are available to prescribe but folinic acid may be more suitable in certain situations. Poor dietary folate intake—treat with folic acid. 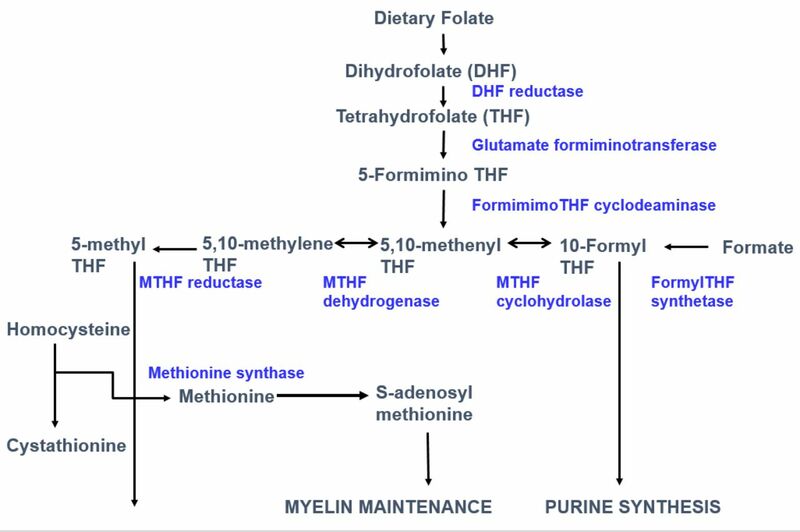 Deficiency of the cerebral folate transporter (FOLR1)—treat with folinic acid (as folic acid may compete with 5-methyltetrahydrofolate for transport across the blood–brain barrier and worsen clinical signs). Mitochondrial disorders—possibly due to impaired energy or oxidative stress—consider treatment with folinic acid. Epilepsy, movement disorder, language delay, learning difficulty and behavioural problems associated with a very low serum creatinine concentration should lead to investigations to exclude creatine deficiency states, although a low normal creatinine concentration does not exclude these conditions. Low creatinine led to a delayed diagnosis of guanidinoacetate methyltransferase (GAMT) deficiency in two sisters of Turkish Cypriot origin32 after years of investigation in many centres. Treatment with creatine supplementation resulted in the sister with epilepsy coming off all antiepileptic drugs with mild improvement in language, behaviour and general engagement. Had her previous MR brain scan sequences included MR spectroscopy, the diagnosis would have been made earlier. GAMT deficiency is the most common of these rare conditions followed by arginine:glycine amidinotransferase (AGAT) deficiency, both of which, unlike creatine transport disorders, can be helped by supplementation and dietary manipulation. Pyridoxal phosphate (active vitamin B6) is a cofactor in numerous transamination and decarboxylation reactions, including those involved in neurotransmitter metabolism. 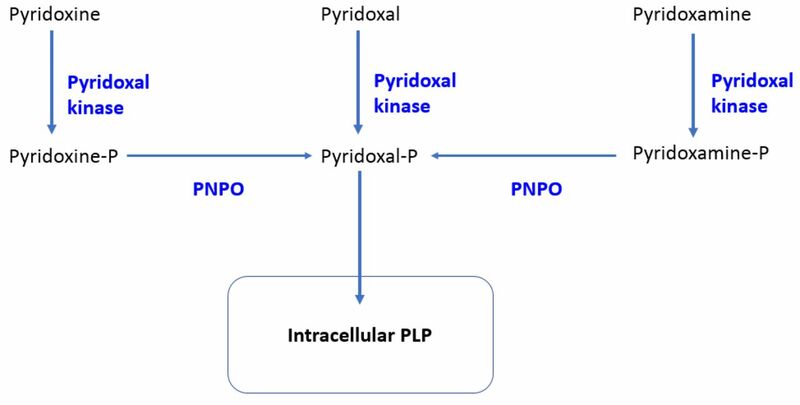 Pyridoxal phosphate is synthesised from dietary pyridoxine, pyridoxal and pyridoxamine by pyridoxal kinase and pyridox(am)ine 5’-phosphate oxidase (figure 8). Pyridoxal phosphate metabolism. Pyridoxal phosphate is synthesised from dietary pyridoxine, pyridoxal and pyridoxamine by PK and PNPO. PNPO, pyridox(am)ine 5’-phosphate oxidase; PK, pyridoxal kinase. Pyridoxal phosphate can be measured in both plasma and CSF, and pyridox(am)ine 5’-phosphate oxidase deficiency is associated with other CSF abnormalities including low concentrations of homovanillic acid and 5-hydroxyindoleacetic acid (5HIAA), raised 3-methyldopa and 5-hydroxytryptophan. In pyridoxine-dependent epilepsy, accumulation of metabolites inactivates pyridoxal phosphate. Pyridoxal phosphate concentrations may be low/low normal in adults with status epilepticus.36 The implication of this is unclear and as yet there are no agreed recommendations for B6 supplementation in the adult intensive care unit. Although this condition is treatable, autosomal recessive biotinidase deficiency is not included in neonatal screening in the UK even though some other countries screen for it. The deficiency can be partial or profound. There may be both early and late presentations. Clinical features include seizures, ataxia, hypotonia, myelopathy, hyperventilation, developmental delay, sensorineural hearing loss, optic atrophy, rashes, recurrent infections and alopecia. Later presentations can mimic neuromyelitis optica or multiple sclerosis. Patients need treatment early to prevent irreversible damage. Biochemical findings may include lactic acidosis or an abnormal urinary organic acid profile and is confirmed by measurement of reduced biotinidase enzyme activity. L-serine, a nutritionally non-essential amino acid, plays an essential role in cellular proliferation, neurotransmitter formation (glycine, D-serine) and myelin and lipid messenger molecule formation.37 Serine deficiency disorders are caused by genetic defects in genes encoding one of three synthesising enzymes of the L-serine biosynthesis pathway, of which 3-phosphoglycerate dehydrogenase mutations, with autosomal recessive inheritance, are the most common. Its severity ranges from a severe lethal antenatal syndrome to a milder adult-onset polyneuropathy phenotype. Children present with congenital microcephaly, cataracts and severe psychomotor retardation and may develop a spastic quadriplegia in early childhood. Intractable seizures include infantile spasms, tonic-clonic, tonic, atonic, gelastic and myoclonic seizures; the EEG can show hypsarrhythmia and multifocal discharges. MR scan of brain shows hypomyelination. Cases of juvenile and adult onset serine deficiency disorders also occur, with mild intellectual disability, atypical absence seizures and progressive polyneuropathy. The diagnosis can be made by demonstrating low concentrations of serine in plasma and cerebrospinal fluid or by genetic testing. Early diagnosis and timely L-serine replacement therapy are important (box 2). Is the cause known with reasonable certainty? If not, are there strong clues on the history or examination to suggest a specific diagnosis? If so, take further as appropriate. If not, discuss potential benefits and disadvantages of reassessment with the individual and family/carers and obtain consent. Basic metabolic screen (see text). Many adult patients with epilepsy and complex neurology without an aetiological diagnosis will not have had appropriate investigations at presentation or neonatal metabolic screening. We therefore advise that patients attending adult neurology clinics should have their diagnosis reassessed and further investigations discussed with the individual (if possible), relatives or carers. Despite this advice, we recognise that it may be difficult to judge the value of such reassessment for an individual; decisions are also made more difficult when the patient does not have capacity. For treatable conditions, although an early childhood diagnosis is much more likely to influence outcome, a diagnosis in adulthood can also be helpful. Given ongoing advances, particularly in genetics, clinicians should view the need for reassessment as an ongoing process.
. De novo, heterozygous, loss-of function mutations in SYNGAP1 cause a syndromic form of intellectual disability. Am J Med Genet 2015;67A:2231–7.
. Mitochondrial hepatopathy in adults: a case series and review of the literature. Eur J Gastroenterol Hepatol 2013;25:892–8. , eds. Inherited Metabolic Disease in Adults. Oxford;New York: Oxford University Press, 2016.
. MTHFR genetic testing: Controversy and clinical implications. Aust Fam Physician 2016;45:237–40. Pagon RA , et al.
. GeneReviews. In: Adam MP , Ardinger HH , Pagon RA , et al. , eds. Pyridoxine-Dependent Epilepsy. Seattle: University of Washington, 2001. Contributors LN planned the manuscript, wrote the framework and significant sections and guided and edited the whole. RS wrote the section on neurophysiology, produced the tables on malformations of cortical development and electroclinical syndromes and contributed to selected conditions. NM wrote the section on mitochondrial disease and contributed to selected conditions. EM wrote the section on metabolic disorders, provided related figures and tables, helped edit the overall manuscript and contributed to selected conditions. Funding EM’s contribution to this work was undertaken at UCLH/UCL, which received a proportion of funding from the Department of Health's NIHR Biomedical Research Centres' funding scheme. Competing interests LN has been on an advisory board for GW Pharmaceuticals. EM has been the recipient of grants/research support from Nutricia UK, Shire Pharmaceuticals UK and Sanofi Genzyme. She has been in receipt of honoraria or consultation fees from Vitaflo UK and funding to undertake clinical trial work from Sanofi Genzyme, Shire Pharmaceuticals UK, Biomarin Pharmaceutical, Ultragenyx Pharmaceutical Inc., Synageva Biopharma Corp. and Amicus Therapeutics. Provenance and peer review Commissioned; externally peer reviewed by Mike Kerr, Cardiff, UK, and Owen Pickrell, Cardiff, UK.